Complete Electric has the largest service dept in Indian River County with (25) service vehicles on the road. We specialize in customer service. Our goal is to make every customer a customer for life. If you are not happy, we are not happy.We have an A+ rating on the BBB, and we maintain the highest rating with our Angies List client base. Customer feedback is very important with us. We can handle any project you have small or large in a Residential, Commercial, or Industrial setting. We offer prompt same day service for emergencies, and we understand the inconvenience of being without power. We make these calls a priority and help in any way we can to restore your power. We have factory trained GENERAC and KOHLER generator technicians. 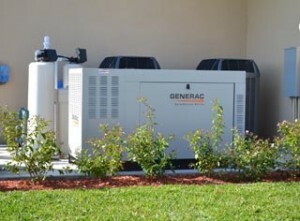 We can service your existing generator, or provide and install a brand new generator for your home or business. We offer turnkey solutions for generator systems, from the initial meet and quotation, to the final startup demonstration with the owners. We offer solutions for your portable generator connections as well. It is not safe to back feed your home with a portable generator, and there is a risk of fire if not done properly. Allow us to install a UL listed, safe connection with mechanical locking device to prevent unwanted back feed. Service Changes, and service upgrades. Surge Protection systems to protect from lightning strikes nearby, and utility company power surges. We have solutions that come with 10 year warranties. Bucket Truck and Auger truck pole setting services. We can handle parking lot lighting repairs, commercial sign repairs, etc. We offer free quotation for most projects, and can schedule a technician right away for your urgent service call.